So why is it always "Back East" and "Out West?" Last Thursday, Erik and I hopped a JetBlue flight to Boston for a weekend trip to see his family. Arriving at the Alamo car rental joint, we checked in using the kiosk to get our compact car. A little receipt printed out instructing us to go out and pick a car from the Compact Car row. The Compact Car row was empty. A jaunt back inside to ask and they said, "Oh, just pick a Midsize." Back out, we note that the Midsize row is also empty. They say to pick a Full Size. This however is far less than ideal as it means a Chevy Impala (huge land yacht) or a four-door Ford Explorer. We'd rented a compact car since we expected to be driving in the city. We went back in and asked about the Prius in the Premium row and were told that was reserved. Erik mentioned that so was our Compact, but that didn't really work out for us. The manager went to go see what she could find. With a little black Chevy HHR pushed through the car wash, we were finally on the road. The first stop was Erik's brother Greg's house. Greg was incredibly hospitable, offering us a chance to take a nap in his bed made up just for us. He joked that it was the "Young Manse Inn." Not only was it made up, the covers were turned down and there was little candle burning on the bedside. Rising at a far more reasonable hour of 10 a.m., we headed into Cambridge for breakfast and then toured around Harvard. We caught up to the Unofficial Tour of Harvard and followed them to the end of their route. It was just the ticket, complete with irreverent commentary from the tour guides. We took the T out to Boston Common and started our way down the Freedom Trail. Touring graveyards and King's Church and the Old State House and Fanuil Hall and Paul Revere's House. Along the way we caught up to the National Park Service tour and listened in occasionally. The Boston Massacre wasn't so much of a massacre as a bunch of surly drunks picking on some soldiers, one soldier stumbling and accidentally firing and the other soldiers assuming they were under attack. Five guys died. That's the whole massacre. It sounds far worse when you just tell the summary - British soldiers fired on colonists. Trouble is, like a lot of history, it's actually way more complicated than that. Those dudes who got shot had been throwing rocks and ice at the soldiers for a few hours. Nowawdays they would've gotten tazed and arrested. Ah, our founding mythology. It's, um, well, not as pretty and clean as you'd like to think. After Paul Revere's house, Greg was getting a bit tired and we were sort of historied out. After a quick trip through Mike's Pastries for a canoli, we jumped the T out to the Sam Adams Brewery. The brewery was closing early for a special party, but they escorted us back for a quick look around which actually turned into a pretty good tour. Greg admired the Beer Color Spectrum poster, so that seemed a perfect birthday gift for him, plus a 3 pack of specialty beers. We headed back to the North End for dinner and the iPhone and Yelp yielded a bevy of well-reviewed dining options. We settled on Panza and had an outstanding meal. My free-form lasagna was a treat, but Greg's enormous butternut squash tortellinis were the clear winner for best meal. We escorted Greg back home and picked up the car to head to Brewster to the Old Manse Inn. Erik's mom and step-dad bought the place a couple of years ago and it's just gorgeous. Scott and Jess, Erik's other brother and sister-in-law were also there with their dog Snickers. Snickers and Maggie (Karen and Rich's Portuguese Water Dog) spent the evening wrestling while we lounged on the sofa. We settled into the Chart Room for the remainder of the weekend. We rose a little late for breakfast, but Karen cheerfully made us fritatas anyway. In the afternoon, we headed out with Scott and Jess to Provincetown. We had lunch at Vorelli's, trying the much lauded Boursin burger. We wandered up and down Commercial Street enjoying the mix of shops and cheered on the wedding party coming down the street in bike cabs. We decided to take a dune tour and learned the unfortunate history of the dunes. They were once a forest, but the pilgrims cut it all down, the top soil blew away, and it's all been eroding ever since. Oops. They've replanted some compass grass to try to keep the sand in place now. We headed back to Brewster for lobster dinner. 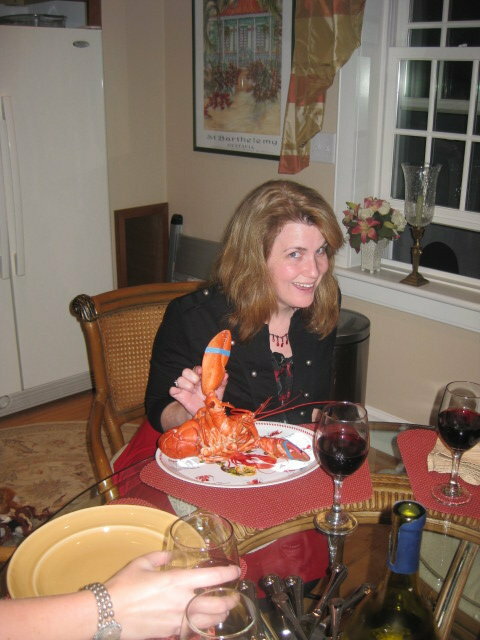 Now, I have never tackled a lobster before. It's just not a priority in California. With tools in hand, I read the instructions on my plate and dove in. It's a messy beast, but pretty tasty. In the future, I suspect I'll let others do the work for me and just enjoy the meat in dishes. The whole lobster was a positively overwhelming amount of food, so I gave up halfway through the tail. The next morning, we rose and Erik wanted to have breakfast in the dining room like a real guest. So Rich brought us our fruit salad and blueberry pancakes at the table. The dining room used to be a church for a very small congregation. I can't imagine more than 20 people could fit there. After breakfast, we played a bit of Slide 5 and took a walk down to the beach where Maggie was overjoyed to chase a stick into the water. We also popped into the Brewster General Store. In the late afternoon, Scott and Jess headed home and Erik and I headed out to Nickerson State Park for a hike around Little Cliff Pond. When we got back it was time for dinner. We'd decided on Abba, and it was the perfect choice for me. We shared mussels in a sort of Tom Kha sauce and grilled calamari in a coconut lime sauce. For entrees, Erik had the beef cheeks and I had the duck breast. Both were perfect. I look forward to getting to eat there again in the future. At dinner, Rich asked the elephant in the room question: "So what are your plans? Getting married soon?" It was hilarious to watch Karen's face. The "You can't ask that!" and "Oh my god you did not just say that!" as she recoiled was awesome. Back to the inn where Karen didn't want to let Erik go home to California. We stayed up chatting about things. In the morning we rose for breakfast burritos and mojito melon. We headed out to see the beach at lower tide with Karen, Maggie, and a tennis ball. Maggie was in heaven. We also toodled down to the Brewster bookstore, a classic small-scale bookshop of ultimate danger. Luckily, many of the most tempting titles were already on my shelf thanks to the girls. Back at the inn we packed our bags and headed out to the airport. The TSA gave me a rather thorough working over, largely because I had my hair up in a metal clip. Oy. Unfortunately, my bag with iPhone charger and headphones got lost in the shuffle. On the plane, we watched Dr. Who Waters of Mars and Up. Up will make me cry every time, but it's just the best. Home again, we found happy kitties (thanks Susanne!!!) desperate for snuggles from their people and a toasty warm house that cooled rapidly in the evening breeze. Looking over the bay area from the plane, I'm once again reminded that I live in the best place on earth. Even if other places are great to visit, the SF Bay is home. Could it be related to the fact that the majority of American settlement spread from east to west, and the linguistic bindings have stuck around since then?